Let’s Count to 100! comprises 11 bright panoramas, each featuring a delightful assortment of 100 different objects. 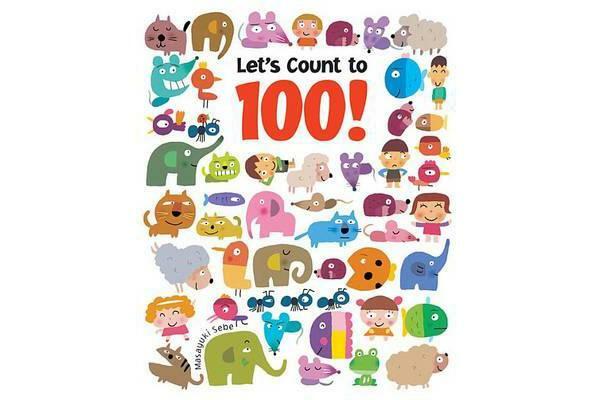 Readers are invited to count the items and are also challenged to find specific details, such as a mouse with a red bow or a lone rabbit amid a giant flock of sheep. This book is packed with appealing images of children, fish, cats, moles and other cute critters —- no two of which are alike —- and readers will enjoy the many different moods and expressions on display. Each spread is also full of hidden dramas youngsters will love discovering for themselves, such as a hungry piranha poised to take a nibble of an elephant’s pink trunk. Kids will also like spotting how each scene, such as a meandering stream or a bustling cityscape, visually connects to the one that came before and the one that follows.